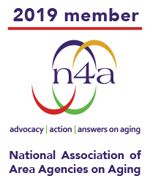 Triangle J Area Agency on Aging "Engaging in Aging"
Mandated by the federal Older Americans Act of 1965, as amended, the Triangle J Area Agency on Aging (TJAAA) focuses on its partnership efforts as a means of leveraging a quality continuum of support for the region's older adults. Our mission is to promote the highest level of well-being of older adults in the seven-county region by partnering with organizations to provide a comprehensive system of opportunities, services and protective supports. reside in a long-term care facility. In addition, we are a resource center offering assistance or training support for their family caregiver or other family members.